God is good towards us: let us be the same towards our brethren. If we pardon our brethren from the bottom of our hearts, Our Lord Jesus Christ will remit our debts (our sins). The Apostle describes for the Christian the armour he must put on to enable him to withstand in those woeful times the powers of hell (Epistle). He gives him a girdle, a cuirass, a shield, a helmet and a sword, so that, strengthened in the Lord, Whose will nothing can resist (Introit), he may be protected against those who persecute him (Communion ). Thus preserved from all adversity by the effect of the unceasing goodness of the Lord, the family of God, which is the Church, will be enabled to glorify His name by good works (Collect). Therefore the Gospel speaks to us of the charity towards our neighbor which is the abridgment of the whole morality of Christianity. If God has been good towards us, we must be the same towards our brethren, or how shall we escape the proceedings of the powerful creditor whose debtor the whole world is, and to whom all will have to render account. If we pardon our neighbour from the bottom of our hearts, the Master will remit our debts, otherwise He would deliver us to the executors of His justice until we have paid all we owe Him. Let us ask God to deliver us in His goodness from the assaults of the devil and to help us to imitate the divine mercy by the practice of charity (Collect). O Lord, we beseech Thee, to keep Thy household in continual godliness that,through Thy protection, it may be free from all adversities, and devotedly given to serve Thee in good works to the glory of Thy Name. Through our Lord Jesus Christ, Thy Son, Who liveth and reigneth with Thee in the unity of the Holy Ghost, God, Forever and ever. Let us pray. Graciously hear, O Lord, the prayers of Thy Church that, having overcome all adversity and every error, she may serve Thee in security and freedom. Through our Lord Jesus Christ, Thy Son, Who liveth and reigneth with Thee in the unity of the Holy Ghost, God, Forever and ever. Lesson from the letter of St Paul the Apostle to the Ephesians. Brethren, Be strengthened in the Lord, and in the might of His power. Put you on the armor of God, that you may be able to stand against the deceits of the devil. For our wrestling is not against flesh and blood, but against principalities and powers, against the rulers of the world of this darkness, against the spirits of wickedness in the high places. Therefore take unto you the armor of God, that you may be able to resist in the evil day, and to stand in all things perfect. Stand therefore having your loins girt about with truth, and having on the breastplate of justice, and your feet shod with the preparation of the gospel of peace, in all things taking the shield of faith, wherewith you may be able to extinguish all the fiery darts of the most wicked one. And take unto you the helmet of salvation, and the sword of the Spirit, which is the word of God. Thou hast been our refuge from generation to generation V. Before the mountains were made, or the earth and the world was formed from eternity and to eternity Thou art God. Alleluia, alleluia. V. (Ps. 113: 1) When Israel went out of Egypt, the house of Jacob from a barbarous people. Alleluia. 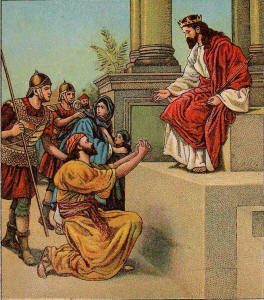 There was a man in the land of Hus, whose name was Job, simple, and upright, and fearing God: whom Satan besought that he might tempt: and power was given him from the Lord over his possessions and his flesh; and he destroyed all his substance and his children; and wounded his flesh also with a grievous ulcer. Mercifully receive, O Lord, these offerings, by which Thou art pleased to be appeased and in Thy powerful goodness to restore our salvation. Through our Lord Jesus Christ, Thy Son, Who liveth and reigneth with Thee in the unity of the Holy Ghost, one God Forever and ever. Protect us, O Lord, who assist at Thy mysteries, that, cleaving to things divine, we may serve Thee both in body and in mind. Through our Lord Jesus Christ, Thy Son, Who liveth and reigneth with Thee in the unity of the Holy Ghost, God, Forever and ever. My soul is in Thy salvation, and in Thy word have I hoped: when wilt Thou execute judgment on them that persecute me? The wicked have persecuted me: help me, O Lord my God. We who have received the Food of immortality, beseech Thee, O Lord: that what we have taken with our mouth, we may follow after with a pure mind. Through the same Lord Jesus Christ, Thy Son, Who liveth and reigneth with Thee in the unity of the Holy Ghost, one God For ever and ever.